Rolling Surf Resort is ideally situated on Caloundra’s Kings Beach and takes pride in being the closest resort to the ocean. Our spacious one, two and three bedroom apartments are fully self contained and comfortably furnished, our apartments offer varied views including the resorts pool, the ocean or private courtyard apartments. Enjoy relaxing on your balcony or exclusive rooftop area or why not stay in a pool entry apartment, you can swim right up to the balcony gate! 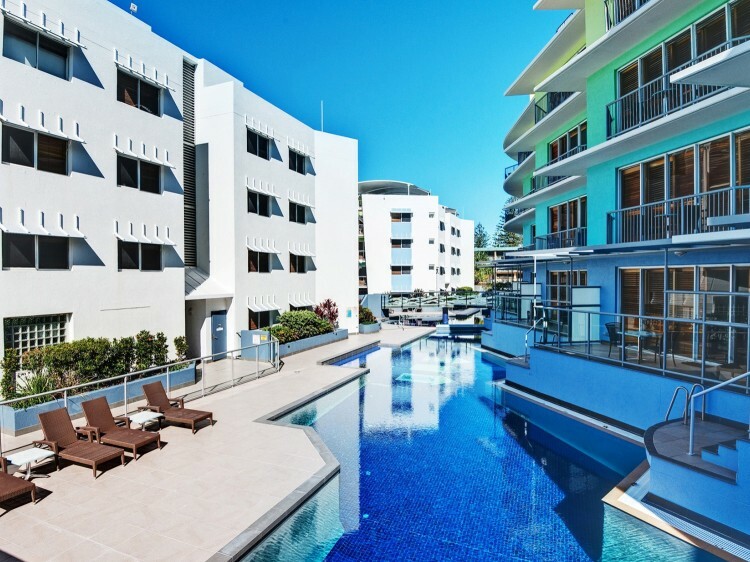 When you're not enjoying Kings Beach, visiting the local attractions or touring the hinterland, take advantage of the following facilities; a spectacular resort pool that spans the entire length of the resort, sauna, fitness room, games room and BBQ entertainment area, you will find something to indulge every mood. Free WiFi (500MB per apartment per stay) and secure undercover parking is available. Please note: Rolling Surf Resort has a complete non-smoking policy. No smoking permitted anywhere within the building or on balconies. 1 Bedroom Balcony - partial water views from your balcony. Featuring open plan living, dining and kitchen area, laundry facilities, air-conditioning, free WiFi plus ensuite with spa bath. 1 Bedroom Spa - partial water views. Featuring open plan living, dining and kitchen area, laundry facilities, air-conditioning, free WiFi and spa bath. No balcony. 1 Bedroom Rooftop - private rooftop area featuring ocean views, a barbecue, outdoor setting and sun lounges. Each apartment includes an open plan dining, living and kitchen area, ensuite with spa bath, laundry facilities and either a sun room or a balcony. 2 Bedroom Spa Balcony - features a balcony overlooking the pool, 2 bathrooms, open plan living, dining and kitchen area, laundry facilities, air-conditioning and spa bath. 2 Bedroom Oceanfront Courtyard - ground floor apartment with private courtyard. Located on the ground floor of the building featuring 2 bathrooms, open plan dining, living and kitchen area, spa bath, laundry facilities and air conditioning. 2 Bedroom Oceanfront Balcony- oceanfront location featuring 2 bathrooms, open plan living, dining and kitchen area, spa bath, laundry facilities, air conditioning, heating and a balcony with ocean views. 2 Bedroom Pool Entry - enjoy direct access to the resort pool from your private balcony. Featuring 2 bathrooms, open plan living, dining and kitchen area, laundry facilities, air conditioning and spa bath. 2 Bedroom Poolside Rooftop - located in the poolside building featuring open plan dining and living area, main bedroom with ensuite, second bedroom with spa bath, kitchen, laundry, air-conditioning, balcony and Free WiFi. Private rooftop access is via an external stairwell with barbecue and outdoor setting. 2 Bedroom Poolside Rooftop No Balcony - located in the poolside building featuring open plan dining and living area, main bedroom with ensuite, second bedroom with spa bath, kitchen, laundry, air-conditioning and free WiFi. Private rooftop access is via an external stairwell with cold water spa, barbecue, outdoor setting, sun lounge and views of the ocean. 2 Bedroom Oceanfront Rooftop - with magnificent views of the Pacific Ocean from the private rooftop area, featuring a sauna, barbecue, outdoor setting and sun lounge. Apartment features open plan dining, living and kitchen area, laundry facilities, spa bath, air conditioning, free WiFi and balcony. 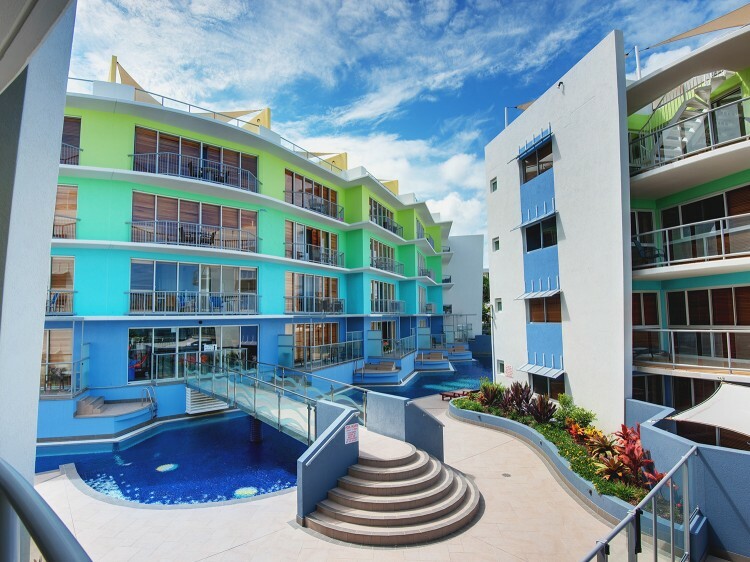 3 Bedroom Oceanfront Courtyard- spacious apartment located on the ground floor with private courtyard and 2 bathrooms. Featuring open plan dining and living area, main bedroom with ensuite, second bathroom with spa bath and laundry facilities. 3 Bedroom Oceanfront Balcony- oceanfront location featuring 2 bathrooms, open plan living, dining and kitchen area, spa bath, laundry facilities, free WiFi, air conditioning, heating and a balcony with ocean views. 3 Bedroom Oceanfront Rooftop - featuring amazing views of the Pacific Ocean from either the balcony or private rooftop area. The rooftop entertainment facilities include a barbecue, outdoor setting and sun lounges. Open plan living, dining and kitchen area, laundry facilities, air conditioning, spa bath and 2 bathrooms. Partial Water Views . Free WiFi (500MB per apartment per stay). Overlooking resort pool & partial water views . Free WiFi (500MB per apartment per stay). Ocean Views . Free WiFi (500MB per apartment per stay). Absolute beachfront apartment . Free WiFi (500MB per apartment per stay) . Located on the pool level with direct pool access. Free WiFi (500MB per apartment per stay). Private rooftop access is via an external stairwell with barbecue and outdoor setting. Free WiFi (500MB per apartment per stay). Absolute beachfront apartment . Private rooftop access is via an external stairwell with barbecue and outdoor setting. Free WiFi (500MB per apartment per stay). Free WiFi (500MB per apartment per stay). Private rooftop access is via an external stairwell with barbecue and outdoor setting. Free WiFi (500MB per apartment per stay) . The property has a complete non-smoking policy. No smoking permitted anywhere within the building or on balconies.